Dark Flow - evidence of another universe? Dark Flow is a phenomenon that was only observed as recently as 2008. As usual, before we examine what it is and its implications in detail, we need to set the scene by considering a long standing concept. This is the idea that, when viewed on a sufficiently large scale, the density of galaxies within the Universe is the same in all directions. This does not apply to smaller scale observation, of course, as there are known to be clumps of galaxies, known as "clusters". Something akin to this concept was first proposed by Sir Isaac Newton, in 1687 and was subsequently, in the 20th century, proved by observation. It's logical when you think about it: if everything originated from a single point in the Big Bang, subsequently expanding to the Universe we know today, everything's likely to be quite uniform. Whatever you think about astrophysicists, they do come up with some good names! This is the term given to the distance we have to look out into the Universe to find this apparent uniform distribution of matter. It lies approximately 300 million light years away. This is a huge concentration of mass subsequently found to be located 250 million light years away, in the region near the constellations Hydra and Centaurus. It has the mass equivalent of many tens of thousands of Milky-Way-sized galaxies. Its gravitational force is strong enough to affect other galaxies and galaxy clusters over a several hundred light year region. But then the movement of some colossal galaxy clusters that were originally thought to have been affected by the Great Attractor were discovered to be racing towards a slightly different area of space - and this time there was no apparent reason for, or cause of, their motion. According to Hubble's Law, all galaxies should be moving uniformly away from each other, preserving the Cosmological Principle. Then came the 2008 discovery. The Wilkinson Microwave Anisotropy Probe (WMAP), during a three-year survey, discovered a large group of clusters which all seemed to be moving in a roughly uniform direction, at speeds up to 600 miles per second. They were all headed towards a small area of sky between the constellations Centaurus and Vela. As stated above, there seemed to be no apparent cause of this and, because it was an inexplicable phenomenon, it was christened "the Dark Flow". Here we have a map of the universe, with the Milky Way cutting across the centre, left to right. The dark flow is highlighted as four coloured ovals, overlapping each other. They each represent a slice of distance - the blue contains clusters up to 1.2 billion light years away, the green up to a distance of 1.7 billion light years; yellow takes us as far as 2.1 billion light years, while the red is the furthest, at 2.5 billion. 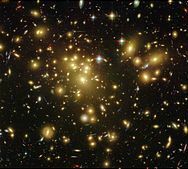 This area contains, amongst others, the Coma Galaxy Cluster, otherwise known as Abell 1656. George Abell was an American astronomer who catalogued around 4,000 galaxy clusters in the late 1950s. He also designated a numerical value denoting the number of galaxies with a high luminosity within each one. He called this the "richness class" and it ranged from 1 to 5. 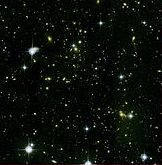 Coma contains over 1,000 identified galaxies and has a richness class of 2. According to NASA, this sector contains a galaxy cluster designated Abell 667. On looking this up, I can find no such number in Abell's list. In fact the only number beginning with "66" is 665, so maybe this is a typo. Let's assume it is and the Dark Flow green sector contains Abell 665. It is the only cluster to have the maximum richness class of 5, because it contains at least 300 galaxies with a high magnitude. 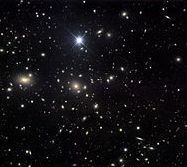 This sector has the distinction of housing the most massive object in the Universe, the galaxy cluster Abell 1689. It contains so much mass, its gravitational effect actually distorts the space around it to such an extent that neighbouring objects appear bent out of shape, in a process known as "gravitational lensing" - a feature usually reserved for black holes. It has a richness class of 4. This furthest out sector contains the strange cluster Abell 520. 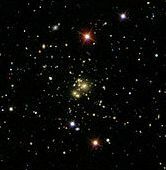 Its internal structure displays such a chaotic nature that it has also been nicknamed the "Train Wreck Cluster". The reason it's unusual is that its dark matter content behaves totally differently from that found in other clusters. Scientists don't know why. Containing up to 300 galaxies, it has a richness class of 3. All this serves to demonstrate just what an unbelievably huge amount of matter is being pulled towards this small region of space, for no apparent reason. Something must be causing the Dark Flow - but what? The Dark Flow is being caused by something beyond the limit of our observable Universe. In fact, its location has been estimated to be at least 46.5 billion light years away. So, currently, we are limited to guessing what it is. If this huge amount of galaxy clusters is being drawn towards a colossal black hole, then it would be accelerating. The Dark Flow, though, displays constant velocity over billions of light years. However conveniently within our knowledge the black hole idea would be, it cannot, therefore, be considered. Just because, within our observable Universe, there aren't any gigantic structures with enough gravitational pull to cause the phenomenon, it doesn't mean they couldn't exist outside of the area we can observe. For all we know, the actual Universe could be billions and billions of times bigger than our observable bit, containing all manner of things about which we know nothing. That concept alone is pretty awe inspiring. This is the most tantalizing theory. The premise goes that, just after the Big Bang, before the inflation of the Universe took place, there was a sort of "cosmic foam" existing as a collection of "bubbles". One of these bubbles suddenly expanded, eventually becoming the Universe we live in today. But what of the other bubbles? The head of the NASA team that discovered the Dark Flow, Dr Alexander Kashlinsky, declared that: "If you go to sufficiently large scales you should see structure that is outside this bubble, outside our Universe. If we live in such a world, these structures would cause this motion and we suspect that this is what we are seeing". So, the Dark Flow is being hailed as the first evidence of the existence of another universe - or even the "multiverse". If Dr Kashlinsky is right (and, to be fair, some astrophysicists have disputed his team's findings), then certain implications and questions arise from his theory. Does this mean that our Universe has a boundary, separating our "bubble" from other neighbouring ones? If so, what form does it take? Some sort of membrane? When the galaxy clusters caught within the Dark Flow eventually pass beyond the distance we can observe, will they just seem to disappear? If some other universe is pulling on matter in ours, is our Universe doing the same in the other direction? Will other galaxy clusters slowly become captured by the force causing the Dark Flow? Will all matter in the entire Universe eventually fall under its spell and gravitate towards that one small area of sky?